Spring is when the city of Houston is blooming with azaleas. These showy flowers flourish in varying shades of pink, purple, and white, and are a magnificent sight to behold. In 1955, the annual blooming of the azaleas in River Oaks, along with a pair of iron dog statues, inspired two of the city’s respected artists to create a children’s book called Azalea. The little book published by the River Oaks Garden Club tells the story of a trio of Houstonians, followed by a flower-loving doggie, as they wander through the gardens of the Azalea Trail. The author was Eugene Pillot (1886–1966), noted playwright and composer, and the artist/illustrator was Grace Spaulding John (1890–1972). Not so coincidentally, the main characters in the story are an author, an artist, and a lady of fashion, who was based on Eugene’s sister, Marguerite Pillot Bock. This simple yet wonderfully illustrated children’s book captures a bit of Houston’s unique cultural history which can still be enjoyed today. 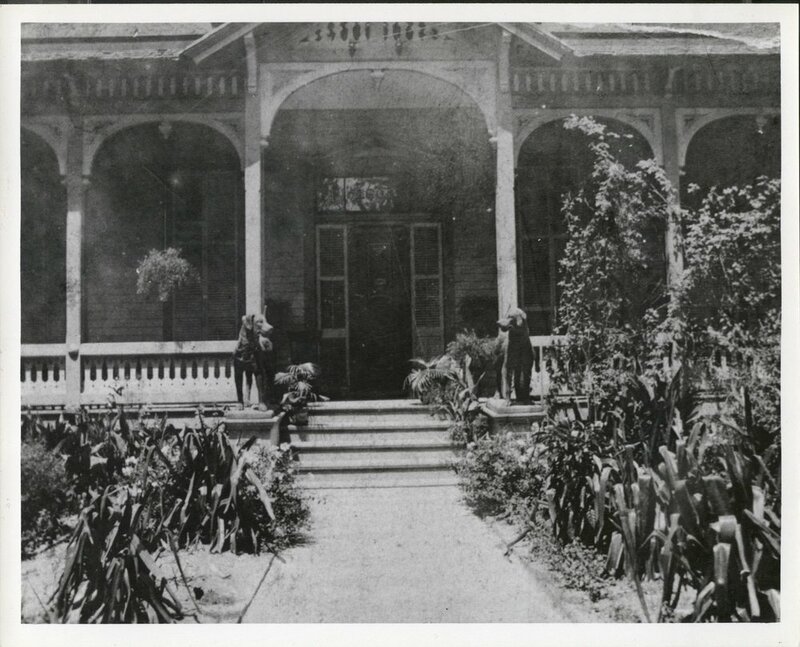 historic photo of the pillot house with the dogs standing guard. Original sketch of one of the Pillot dogs by Grace Spaulding John. Circa 1940. Permanent Collection of The Heritage Society. Azalea was first worked on by Eugene Pillot in 1939, but was published in 1955 in celebration of the twentieth anniversary of the River Oaks Garden Club’s annual Azalea Trail. This was also the year that the Pillot family donated a unique pair of large iron dogs to the Garden Club. For nearly eighty years the dogs had stood guard at the steps of the Pillot family home located at 1803 McKinney. The ornamental dogs were purchased by the Pillots in the 1870s from the firm of Janes, Kirtland & Co. in New York City. The dogs, two editions of #84 in the illustrated catalog, were cast from an original by a sculptor listed simply as "Richardson," and were made of pot metal. Statuary of this type was very popular in the mid to late 19th century, and no doubt the Pillots had seen and admired similar ones in garden settings on one of their many trips to Europe. The dogs were placed on low pylons beside the front steps of the Pillot home and became a neighborhood curiosity, a symbol of social status, and eventually an inspiration to Eugene. Original sketch of “doggie” by Grace Spaulding John. Circa 1940. Permanent Collection of The Heritage Society. Eugene incorporated his family home, including the iron dogs, as the setting for Azalea. In the book, a small terrier, simply called “doggie”, who lives “way down south in the yard of an old fashioned cottage” notices that “he was not the only dog in that yard. Two big dogs stood near the front gate. Doggie thought they were real dogs, only he could never understand why they did not bark back at him.” While secretly following his owner on the Azalea Trail, doggie is so inspired by the flowers that he gathers some and puts them in the car to bring home to his silent dog friends. The author is so pleasantly surprised by what his doggie has done that he orders azaleas to be planted around his house and even formally gives doggie a name, Azalea. In 1965 the Pillot house was given to The Heritage Society and moved to Sam Houston Park and the River Oaks Garden Club gave the dogs to The Heritage Society as well so they could once again be displayed in their familiar spot. Throughout the years, the dogs had often suffered minor damage, as the fragile tails were easily broken. In the spring of 1986, however, vandals did severe damage to the statues, and they had to be removed from the house. The broken remnants were stored until 1989, when a grant from the Wortham Foundation provided the funds for the restoration of the dogs. Restoration work was done by Dell Ray Bronze, the same company that did the Goddess of Liberty at the State Capitol. After the beloved dogs were repaired, a mold was made and reproductions were cast in bronze. The new dogs had stainless steel reinforcing and could hold 300 pounds – strong enough to be climbed upon and petted by children visiting the Park, just as generations of Pillot children did. The originals remain in the permanent collection of The Heritage Society. The children’s book Azalea was the result of the friendship of two local Houston artists who celebrated the beauty and cultural traditions of their city. The annual Azalea Trail continues to offer Houstonians an enjoyable weekend that educates the public about architecture, flower arranging and local horticultural, with the proceeds from the event going back to the community. The beloved Pillot dogs are not only preserved in the wonderful drawings by Grace Spalding John, they remain one of Houston’s historic treasures as they continue to watch over the Pillot house in Sam Houston Park.